Jurgen Klopp has guided Liverpool to their best-ever start to a league season in their 126-year history. The Reds won 3-1 at Burnley last night to continue their unbeaten start to the campaign, winning 12 and drawing three of their 15 Premier League matches so far. Liverpool have also scored an impressive 30 goals – averaging two a game – whilst boasting the best defensive record in the top flight, conceding just six in total. And yet, frustratingly for Liverpool fans, their team remains second in the table, two points behind Manchester City. While LFC have undoubtedly improved hugely under Klopp’s management, they have the unfortunate luck of being in this situation just as City look absolutely incredible under Pep Guardiola. Liverpool's best start to a season in their 126-year history… ? The Spanish tactician had his side stroll to the title in devastating style last season and few would be surprised if they ultimately ended up well clear at the top again this season. 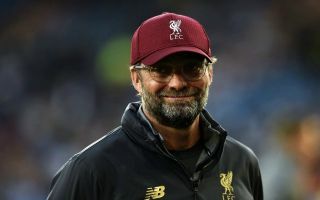 Of course, Liverpool are very close behind so can have confidence of turning things around, but it must be immensely frustrating for fans of the club as in most other seasons their team would likely have a pretty comfortable lead at the top of the table themselves.